Trillium hatched in Toronto in early May 2001, and took flight on June 17 at around 40 days of age. On July 11 he was fitted with a 20-gram satellite transmitter, making him the second peregrine falcon from Toronto to be followed through Project Track-'em. Reports from his transmitter were received for a period of approximately two months, and are summarized below. Oct 15, 2001: location unknown. Trillium's transmitter has been silent now for nearly four weeks. Naturally we are concerned, but as usual in such situations we can't know what the cause is for this break in communications. While the transmitters are programmed to last for close to a full year, we know from prior experience that they occasionally fail very prematurely. It's possible too that the transmitter has fallen off Trillium, and landed in a place where the signal can't transmit clearly. The transmitter is attached in such a way that it will fall off on its own after approximately one year, but this isn't an exact science, and we can't rule out the possibility that the stitches broke down much sooner than expected. Of course the third possibility is that Trillium has died. We must remember that on average only one of every four juvenile peregrine falcons survives to reach its first birthday. Thus according to these statistics, we should expect that each year several of the birds we follow through Project Track-'em will die during the period that we are observing them. At this point, we have no evidence to suggest which of the three scenarios outlined above is the most likely. If we receive no further signals from the transmitter, it is entirely possible that we will never know what happened. We will post an update here if we gain any further insights into the situation or receive new reports. Sep 18, 2001: 43.5N, 80.1W (Aberfoyle). Trillium's position has barely changed in the past four days, as he remains just northeast of Aberfoyle. Sep 14, 2001: 43.5N, 80.1W (Aberfoyle). Trillium is back in communication with us again, and it seems that he is still (or again?) in the area of Aberfoyle, Ontario. Sep 10, 2001: location unknown. For the second consecutive reporting window, we have been unable to get any clear signals from Trillium. We went through a silent period like this with him back in July, so all we can do is wait and hope that we get a stronger transmission the next time around on Sep 14 or 15. Sep 2, 2001: 43.5N, 80.1W (Aberfoyle). It seems that Trillium was no more impressed with Mississauga than he was by Ancaster or Dundas, as he has once again returned to the Aberfoyle area. Aug 25, 2001: 43.6N, 79.7W (Mississauga). For the first time in a while, Trillium has moved away from the Aberfoyle area. Today he was on the outskirts of Mississauga, along Highway 403 between Erin Mills Parkway and Mavis Road - less than 10 km away from Nate's territory near the Mississauga lakeshore. Aug 20, 2001: 43.4N, 80.2W (Aberfoyle). Trillium has shifted slightly to the southwest, but is still closer to Aberfoyle than any other town. Aug 16, 2001: 43.5N, 80.1W (Aberfoyle). Whatever territory Trillium has found here in the countryside between Guelph and Campbellville seems to be to his liking, as he has now maintained similar coordinates for a full week. Aug 13, 2001: 43.5N, 80.1W (Aberfoyle). The latest reports from Trillium aren't the best quality, but they do indicate that he's still in the Aberfoyle area. Aug 9, 2001: 43.5N, 80.1W (Aberfoyle). Trillium remains in the area southeast of Guelph, this time moving a bit west from his last location, approaching the small town of Aberfoyle. Aug 4, 2001: 43.5N, 80.0W (Campbellville). After spending the past week in the area west of Hamilton, Trillium has moved back north to the Campbellville area again, and is quite close to where he was two full weeks ago on his first trip out of Toronto. Will he continue to retrace his steps from here? We should know in another four or five days when the next report is scheduled to come in. Jul 31, 2001: 43.3N, 80.0W (Dundas). Since the last report, Trililum has remained west of Hamilton, but has shifted a bit more to the north now, with his signals today coming from around Dundas, Ontario. Jul 27, 2001: 43.2N, 80.1W (Ancaster). Trillium is talking again! He's now just southwest of Ancaster, Ontario, a bit to the southwest of Hamilton. Jul 23, 2001: Location unknown. Tonight's reports from Trillium provided no clear indication of his location. This happens periodically when the satellite is unable to receive a sufficiently clear signal from the transmitter; this may be due to any number of factors, such as atmospheric interference, or the location of the bird (e.g. close to a building which may interfere with signal transmission in some way. Hopefully the next transmission will be more illuminating. Jul 19, 2001: 43.5N, 80.1W (Campbellville). Trillium is on the move! After making himself scarce in Toronto the past few days, we were expecting that tonight's satellite reading might find him elsewhere, and were not disappointed. He has in fact flown quite a distance to the west (~60 km), and is now in the general area of Campbellville, southeast of Guelph, and just a bit to the north of the Mountsberg Wildlife Centre. This area isn't particularly suited for peregrines, so chances are he will continue on, likely to another city since that is the habitat he has grown up in. Perhaps he will pay a visit to the young peregrines in Kitchener before long. Jul 15, 2001: 43.6N, 79.4 W (Toronto). Though Trillium has made himself scarce to the watchers downtown, he is in fact still in the area. 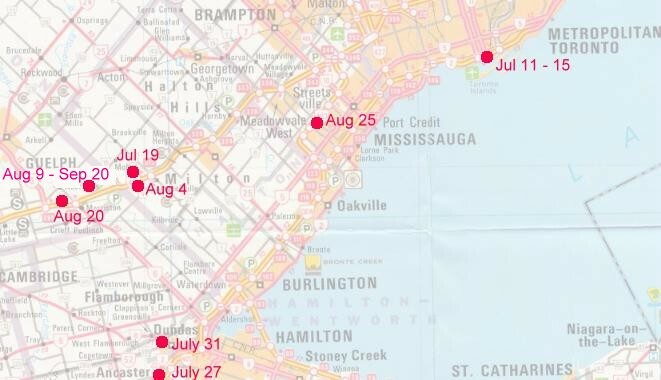 Tonight's satellite report from his transmitter indicates that Trillium is near the east end of Harbourfront. Jul 12, 2001: Toronto. Trillium was in sight this morning around the Redpath Sugar building along the Toronto lakeshore southeast of the downtown nest site. The first report from Trillium's satellite transmitter is expected Sunday night, and it will be very interesting to see where he is at that time, considering that during his time in rehabilitation he learned to hunt for himself, and is thus no longer dependent on his parents for food. Jul 11, 2001: Toronto. After becoming trapped in a crevice of the King Edward Hotel two weeks ago, Trillium has spent most of the time since then recuperating at the Owl Foundation and putting weight back on after having lost ~200 grams during his ordeal. Today Mark Nash and I, along with Mark Heaton and Pud Hunter of the Ontario Ministry of Natural Resources inspected Trillium, and concluded that he was indeed back to full health. Once we were convinced of this, we equipped him with a new satellite transmitter to involve him in Project Track-'em. It was evening by the time we were able to release Trillium back in downtown Toronto. We took him to the roof of 18 King Street East (the nest building), where Mark Nash released him from the southeast corner of the building. Trillium immediately headed off to the east with a very strong flight. He was over Church & Adelaide when Victoria came into view from the west chasing after him, followed closely by Kingsley. Over the Jarvis and King area, the two adults began making repeated stoops at Trillium, which he skillfully avoided. Around this time one of Trillium's siblings (probably Jasmine) joined in the attacks, also making some stoops at him. While it is normal behaviour for the adults to make an initial stoop toward juveniles which have been away from the territory for an extended period, the attacks are normally cut short when visual and/or vocal recognition is made. This is what we observed with Adelaide last year when she was released after having her transmitter applied. For whatever reason, Trillium experienced a much more vigorous and less friendly welcome home tonight. After a couple of minutes of avoiding the dives of the three other peregrines, Trillium was flying lower and lower, and he finally dropped out of our sight somewhere southeast of Jarvis and the Esplanade. Victoria returned to the Scotia Tower a couple of minutes later, followed within the next quarter hour by Kingsley and Jasmine. The many volunteers who had gathered to monitor the release spread out to see whether Trillium could be relocated, but wherever he ended up, he must have settled in to rest overnight, as nobody was able to spot him. Trillium will hopefully come back into view in the morning, and will likely make another attempt to reunite with his family. Trillium squawking for food will likely bring out the maternal instincts in Victoria.